With the stunning revelation surrounding Bliss’s true identity comes the growing threat of the sinister Silver Bloods. Once left to live the glamorous life in New York City, the Blue Bloods now find themselves in an epic battle for survival. Not to worry; love is still in the air for the young vampires of the Upper East Side. Or is it? Schuyler has made her choice. She has forsaken Jack for Oliver, choosing human over vampire. But old loves die hard...And even coldhearted Mimi seems to suffer from the ties that bind. Young vampires unite in this highly anticipated fourth installment of the New York Times best-selling series. I love the Blue Bloods series. And I loved this book even more. The Van Alen Legacy finally wove together several of the plots that had been waiting in the wings for a while. My favorite character is Schuyler, and that’s why I was a little disappointed with how the focus of this book came away form Schuyler and centered more on the two other narrators, Bliss and Mimi. Schuyler as a character was, I think, the best and most impressive yet. She’s traveling the world with no one but Oliver by her side, and she has a team of Venerators on her trail, yet she stays strong and cool. Plot-wise, this book was a HUGE leap forward. And just like previous books, people die. People that I loved and really, really, really didn’t want to die. Romances blossomed and were reinvigorated, or crumbled and shattered. It was intense, and I almost didn’t see the ending coming. Again Melissa de la Cruz gives us an amazing book that’s hard to put down. 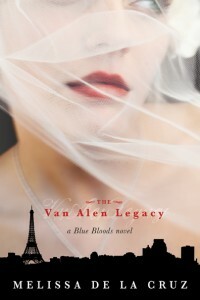 If you’re a fan of the Blue Bloods series, make sure you pick up The Van Alen Legacy.